If you haven’t figured it out yet, we geek out about a number of things here at Project-Nerd. One of the main things we all geek out about is food. So when somebody offers up an awesome food accessory, especially one that involves pizza, we get a bit excited. Case in point, Fred & Friends’ Pizza Boss 3000 Circular Saw Pizza Wheel. Real men don’t use wimpy dime-store pizza wheels. Show that pizza you mean business ith our new Pizza Boss 3000. It’ll blast through pepporoni, extra cheese, even those pesky anchovies. It’s built from tough engineering-grade plastics and the laser etched stainless steel blade has a removable shield for easy clean up. Clear pastic gift box. This fun pizza cutter is just $12.99 on Amazon and listed as “great for parties” and sure to be a talking point. 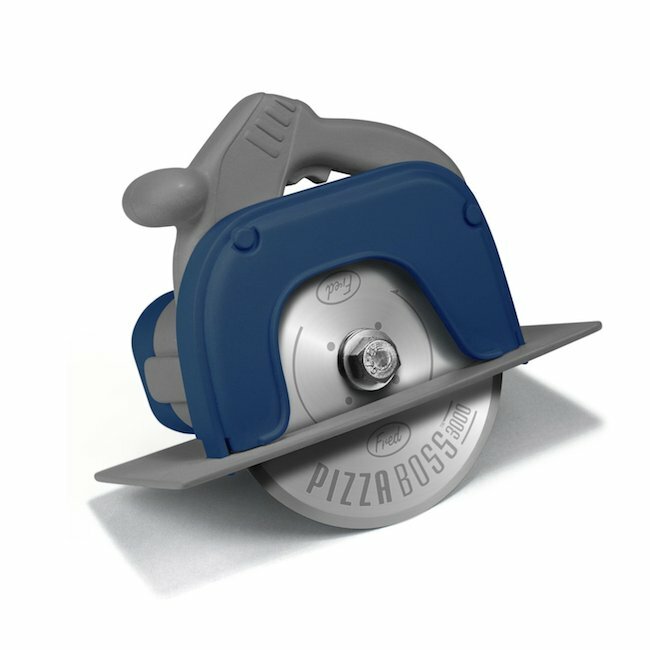 That’s all fine, but we’ll talk after we eat our pizza, even if we do enjoy cutting it up with this Pizza Boss 3000 Circular Saw Pizza Wheel.